Full support for MotoX smartphones, including devices with Android 4.4.4. Servicing of MotoX with Android 4.4.4 requires rooting (unlike devices with lower Android versions). Here you’ll find out which versions of Android can be serviced without rooting. This procedure can be performed in the following Motorola devices: Motorola Atrix 3 HD, Atrix HD LTE, DROID MINI, DROID RAZR M 4G LTE, DROID ULTRA, DROID ULTRA MAXX, MB886, Moto X, Photon Q 4G LTE, RAZR HD, RAZR M, RAZR MAXX HD, Softbank 201M, XT1030, XT1052, XT1053, XT1055, XT1056, XT1058, XT1060, XT1080, XT1080M, XT897, XT902, XT905, XT907, XT925, XT926. Important: this one-click solution works with devices running on Android version lower than 4.4.4. Devices with non-unlockable bootloader (not supported by the phone manufacturer’s Bootloader Unlock program) now can have their boot unlocked: the solution grants access to rooting, servicing, installing custom firmware and other operations. Find full manual on the official website. We have reorganized and simplified Direct unlock / Read unlock codes / Repair IMEI procedures for XT907/925/926 with Android 4.4.2. Just root the phone, and it's ready to be serviced. 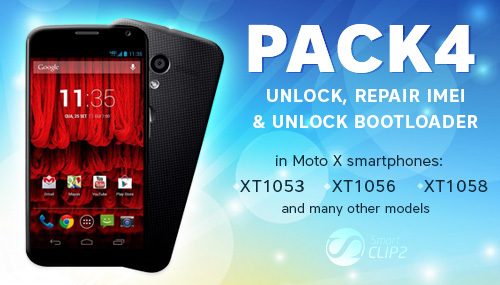 We have examined and fixed customer-reported issues regarding unlocking MotoX-series. We have added the possibility to root your device via CWM or TWRP. In order to root the smartphone, boot it into the recovery mode and root it using “Autodetect” method.